From the window of my hotel room in Bethlehem, I could see the "security" wall that separates the West Bank from the rest of Israel. Among the graffiti expressing the pain of the Palestinians is the following quote from Kurt Tucholsky, an early 20th century German Jewish journalist: "A country is not only what it does, but what it tolerates." I was in the birthplace of Jesus attending a conference called "Christ at the Checkpoint: Theology in the Service of Peace and Justice." In the city where Jesus Christ was born two thousand years ago, several hundred delegates from around the world joined with Palestinian Christians to attempt to see scripture and the world through the lens of the Palestinian experience. I found myself in the home of a hospitable Palestinian family in Beit Sahour near Bethlehem. Paul Alexander and I were observing a meeting of the Popular Committee to Defend Oush Gurab (which means "the nest of the crow," referring to a peak in Beit Sahour). While the dialogue of the dozen men and women around the living room was in Arabic, we received occasional translation to help us understand all that was happening. The hilltop of Oush Garub used to be an Israeli military base surrounded by Palestinian communities. As security priorities have changed over the past several years, the Israelis decided to dismantle the military base so they could apply resources elsewhere. Over the past few months, an organization called "Women in Green" has rallied both the support of Israelis who live in West Bank settlements to call on the government to reclaim this land for the Jewish people. The government has acquiesced to their demands, and began clearing ground on the site a few months ago. In response, Dr. Mazin Qumsiyeh called together a group of community leaders to form the Popular Committee to Defend Oush Gurab. The new organization's first nonviolent protest included dozens of protestors and crescendoed with a Lutheran pastor leading the people in the Lord's Prayer. At that moment, the Israeli Army unleashed tear gas on those gathered, dispersing the crowd. A few weeks later, the Israeli army met the next nonviolent protest group with rubber-tipped bullets. Later, a storm blew into Beit Sahour, dropping temperatures by 20 degrees. Simultaneously, an army construction team blew into town, constructing an entire small watchtower on the hilltop in less than three hours. The watchtower sits alone, protecting and securing nobody, on a hilltop surrounded by Palestinians. What will the soldiers watch from this tower? What will they see? Who will they protect? Dr. Mazin and his committee view a watchtower as a logical first step in what may eventually be yet another Jewish settlement on the Palestinian land. Back in the relative calm of my hotel room, I was once again pondering the words on that great barrier that defines daily life in Bethlehem and the West Bank, but with a slight alteration: "The church is not only what it does, but what it tolerates." So many times, over so many centuries, the Church has tolerated injustice. At best, we claim we don't see the injustice, or that the issues are too complex, or try to find a suitable scapegoat so we can wash our hands of any responsibility. At worst, we support theologies and government policies, foreign and domestic, that contribute to and perpetuate injustice. 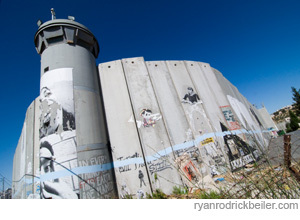 I had been staying in my Bethlehem hotel room for four days, but did not even know I could see the Wall from my room until one morning. I did not have the right vantage point. It was only when I walked up to the windows and sat at the desk that I noticed the Wall. I was blinded to harsh realities just a few hundred feet from my window. How often do we insulate and isolate ourselves from the great injustices, viewing the world from watchtowers that affirm our prejudices and lack of involvement. As the church of Jesus Christ, we can no longer tolerate viewing the world from our old comfortable seats. We must stand up, look at the world from the vantage point of the marginalized, and refuse to continue to tolerate their dehumanizing plight. My friend Marwan is a brave, strong Palestinian man who is giving his life to nonviolent resistance against injustice. At great personal risk, he let Paul and I see the Palestinian people in their home as they struggled. If I am to be true to the call of Jesus Christ, I must regularly try to see the world through Marwan's eyes, and never be satisfied with tolerating his plight. The construction of the watchtower I witnessed today was unjust and hurtful to people created in the image of God. As the Church of Jesus Christ, we cannot tolerate this injustice by remaining silent. As Peter said nearly two thousand years ago, we cannot help to speak about what we have seen and heard. Troy Jackson is senior pastor of University Christian Church in Cincinnati, a graduate of Princeton Theological Seminary, and earned his Ph.D. in United States history from the University of Kentucky. He is author of Becoming King: Martin Luther King Jr. and the Making of a National Leader (Civil Rights and the Struggle for Black Equality in the Twentieth Century) and a participant in Sojourners' Windchangers grassroots organizing project in Ohio.